The journey to the Egyptian Afterlife is complicated and dangerous. First of all there are various evil spirits that will try to lead your soul astray and then there are the judgments. During one judgment you will be asked a series of questions by a council of 42 gods. Each question must be answered in a very specific way and if you get one answer wrong you fail the test. Another judgement involves Anumbis taking your heart out and weighing it against Maat’s feather of truth. Maat is the goddess of cosmic balance and justice, often represented in Hieroglyphic form by a feather. If your heart is heavier than this feather/goddess, that means you’ve been bad. Bad people’s hearts are devoured by Ammit, a devilish creature with the head of a crocodile and a body that has hippopotamus and lion features. To help the souls of the deceased find their way safely to the afterlife, Egyptian scribes would paint funerary spells on coffins. These texts essentially served as guides for the souls of the deceased. 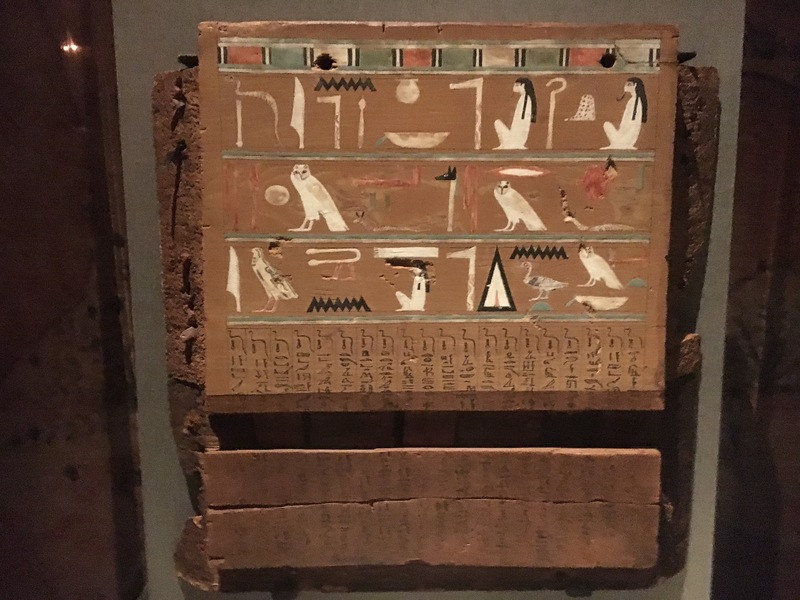 An example of spells like these can be seen in the picture below of a panel from the interior of a coffin dated to the Middle Kingdom (c. 2055 BCE – c. 1650 BCE) on display in our Hall of Ancient Egypt. The three upper rows of carefully drawn and painted hieroglyphs give the name of the coffin’s owner, the lady Satmeket. Columns of cursive hieroglyphs below contain funerary spells, all beginning with the phrase djed medu- “words to be spoken”. These particular spells are the answers to the questions that will be posed by the council of 42 gods. Basically this is an ancient Egyptian cheat sheet. The complete set of answers would have ringed the entire interior of Satmeket’s coffin. Briefer spells are also incised in the joints. These spells would have provided other forms of magical protection. Funerary spells like these would have been expensive as most ancient Egyptians could not read or write and therefore only a select few in society had the ability and knowledge to write the spells, and they charged a premium for their services. In fact, in the Old Kingdom (c. 2613 BCE – c.2181 BCE) only the royals were allowed to use these texts. However as time went on, other ranks of society were allowed to use them, the only issue being whether you could afford to pay a scribe to write them for you or not. So there you have it. While infomercials today promise the secrets to success in this life for only six payments of $59.99, ancient scribes advertised something very similar for success in the next life! If you’re interested in discovering more secrets of the ancient world, come visit our exhibit halls. There’s much more see!